Steele Sidebottom takes possession of the silver Sherrin during Collingwood's opening AFLX match on Thursday night. One win and one loss from 40 minutes of football is the net result of Collingwood’s experience in the inaugural night of the AFLX tournament. The Magpies were one of six teams, including Adelaide, Fremantle, Geelong, Port Adelaide and West Coast, to play at Adelaide’s Hindmarsh Stadium on Thursday night. 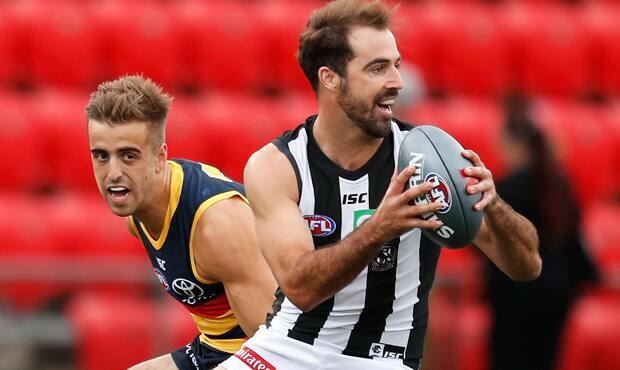 Playing two 20-minute games of 10-minute halves, Collingwood fell 28-points short against Adelaide in its first match, but came home 15-points in front against West Coast. A total of 13 players represented the Magpies across the two games. Among the best performers were James Aish, who played mostly as a forward, and Josh Thomas, who showed slick hands and kicked two 10-point goals from more than 40 metres out against the Eagles. Youngster Brayden Maynard, meanwhile, captained the team for the first time. Ready to do it all again? Ben Crocker was busy against the Crows, and untried rookie Jack Madgen, a basketball convert, served notice across half back. Madgen joined top draft choices Jaidyn Stephenson and Nathan Murphy as the three players to represent the club for the first time on Thursday evening. Fortunately, no injuries were sustained during Collingwood’s two matches, ensuring all 13 players will return to Melbourne with a clean bill of health ahead of Thursday’s intra-club match.